The Recorder is a module for calibration of the multiple-cameras setup of the 3DTracker system. You will see a menu-bar, and a 3D view display where camera images are projected as a cloud of points. 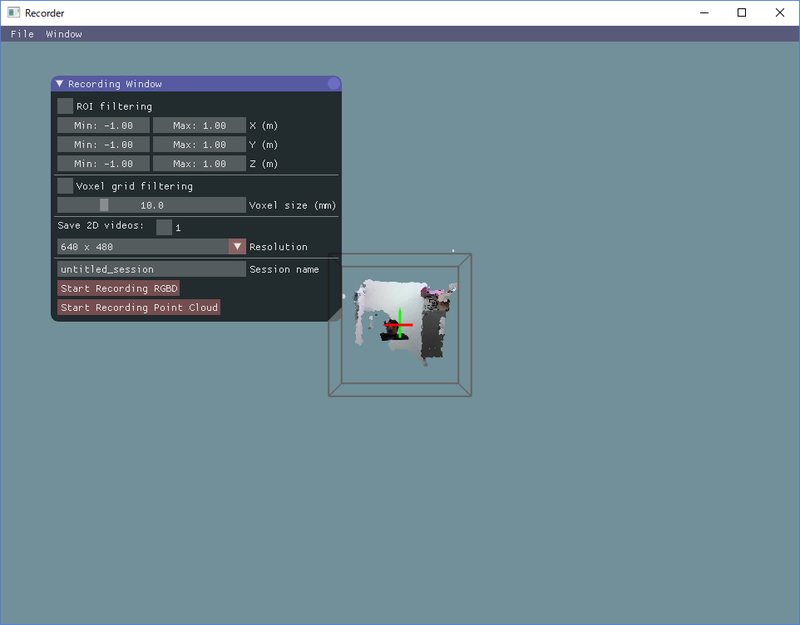 The 3D view can be controlled with the right button (R) dragging of a mouse, as follows: R + drag -> Rotate the view; R + drag + Ctrl key -> Zoom in and out; R + drag + Shift key -> translate the view. The red, green and blue axes shown in the 3D view represent X, Y, and Z axes, respectively. The remaining tool windows can be displayed from the menu tab > ‘Window’. If you look at the point cloud just after starting the Recorder, you will see that the points from different cameras are not correctly aligned. To discriminate clearly between the points from different cameras, you can color the points by enabling “Mark cameras with different colors” in the “Point cloud appearance” window. The misalignment is because of the lack of information about the relative positions of the cameras. The Recorder can estimate the relative positions through a semi-automatic calibration, as follows. During calibration the user scans the recording space with a light pointer, and records the pointer track on the “Calibration window”. Then, the recorder calculates the relative camera positions fitting the observed trajectories recorded from the different cameras during the calibration process. The pointer can be made by epoxying a white ping-pong ball of 40 mm of diameter (Fig 3-2), onto the tip of a white LED flashlight (https://www.amazon.com/dp/B00BIG5JQK/). The ping-pong ball works as a white light diffuser and an IR reflector. 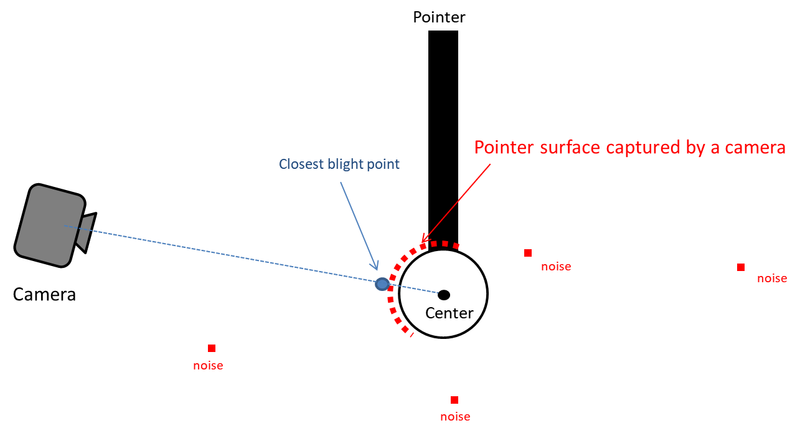 The Recorder estimates the center of the pointer based on the closest blight point from a camera and a radius of the ping-pong ball, as shown below. Display the “Calibration window” from the “Window” menu. “Color filtering” setting section is used for detecting bright points that belong to the pointer. Find the best brightness threshold (the value of “Min Brightness” slider) by enabling “Test” check box. The “Outlier removal” setting section below the “Color filtering” section is used to remove minor noise referred here as small clusters of blight points because of light reflections, etc. For details about the parameters of the Outlier removal, check here (http://pointclouds.org/documentation/tutorials/statistical_outlier.php). Usually, changing only the “Threshold” parameter is fine. You can also check the effect by enabling the check box “Test”. After adjusting filter settings for the pointer detection, click the “Start pointer tracking” button on the bottom in the “Calibration” window. Then slowly move the pointer in the recording space to draw a trajectory for calibration (a spiral trajectory is recommended). Note that the pointer should be in view of all the cameras. To check the view from each camera, display “Camera Monitor” window. To start recording, in the “Recording window”, input the data file name in the “session name” text box and click “Start recording RGBD” or “Start Recording Point cloud” button. With “Start recording RGBD”, raw data consisting of RGB images and depth (D) images is stored. The size of the raw data is relatively big (around 300 MB/camera/min). With “Start Recording Point cloud”, the point cloud data captured from the cameras are stored. Combined with the “ROI filtering” which removes the points outside the ROI, and “Voxel grid filtering” which down samples the points, the size of the point cloud data becomes much smaller than that of the raw RGBD data. Use 5 and 10 mm for the voxel size for the voxel grid filtering for mice and rats, respectively. By enabling the “save 2D videos” check boxes for the cameras, you can also save the 2D RGB video, which is useful for tracking (see Chapter 5), preliminary visual observation of behavior, etc. If you choose recording the raw data (RGBD), you can generate the 2D video offline. So, in this case, it is recommended not to check those boxes to reduce the computational load during recording. if you work with the session name that was used previously, the original data will be overwritten. After starting recording, 3D view is disabled and an RGB image is shown instead, reducing the computational load during recording. Click “Stop” button to stop recording. The recorded data is stored in the “data” folder containing the Recorder app (“Recorder.exe”) in the folder named as the “session name” that you have input before recording. See Chapter 9 for details about the output files.